The Neon Staxx Slot takes you back in time to the 1980s. Alive with bright colors and synthesized sound effects, you’ll appreciate this game’s theme and its bonuses, which include both a SuperStaxx feature and a Free Spins feature. With this hot title from NetEnt, you have the chance of spinning a big win! Whether or not you remember the 80s, just about any slot player can appreciate the graphics, sounds, and colors of NetEnt’s Neon Staxx slot. Designed with a retro science-fiction 1980s theme, this 5-reel, 4-row, and 40-playline video slot is an intense, quick-paced thrill ride that features stacked symbols, free spins, and gives you the chance to hit mega wins including a top jackpot prize of 80,000 coins! You won’t find 3D graphics in the Neon Staxx slot machine, but what you will find are the perfect images, colors, and fully synthesized sound effects and music that suit the theme of the slot perfectly, giving it stunning visual appeal. The reels are an explosion of electric colors including purple, blue, yellow, and pink, and feature the standard 10 to A symbols, as well as a lion, panther, hawk, snake, and triangle. Behind the reels, the game’s background looks like the set of an 80’s sci-fi movie, complete with a Tron-like grid texture and geometrically shaped buildings and lightning flashing in the distance. Another interesting feature of the Neon Staxx slot game is that the reels are on a slight angle. They slant toward you instead of the usual upright design, which is common among most online slot machines. This only adds to the overall funky feel of the game. 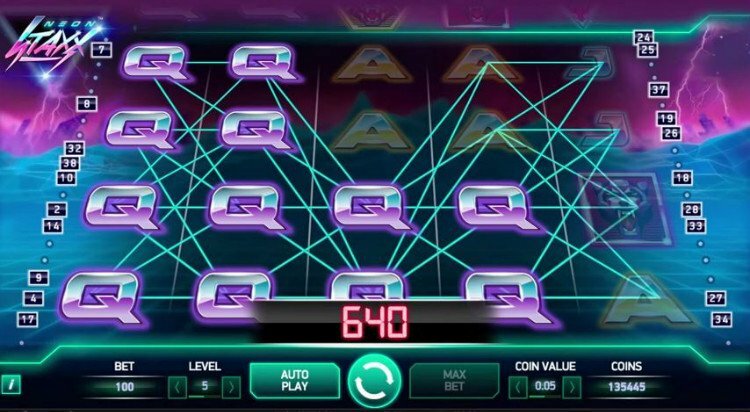 The Neon Staxx slot is available for both online and mobile platforms, giving you the chance to enjoy this NetEnt game on more than one type of device. You’ll be totally amped, no matter where or when you play! 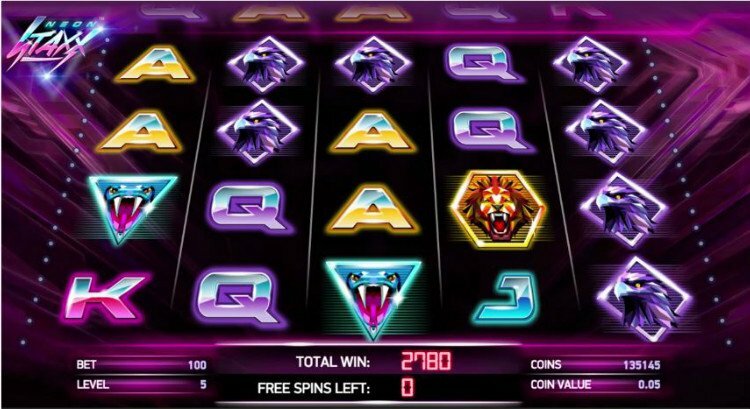 As you have already discovered in this Neon Staxx slot review, this video slot features two main bonuses features: SuperStaxx and Free Spins. Both of the Neon Staxx slot bonuses can help you win more and win bigger. That said, the icing on the cake for this particular slot is the SuperStaxx feature, which is triggered at random and causes stacked symbols to appear on any of the reels. The stacked symbol is randomly chosen and is presented in stacks on the next spin. This bonus can be triggered in both the base game and during the Free Spins feature, which means that it can happen often. As for the Free Spins bonus feature, this is activated when you land 3 or more triangles (the scatter symbol) anywhere on the reels. 3 triangles awards 10 free spins, 4 rewards 15, and 5 give you 20. 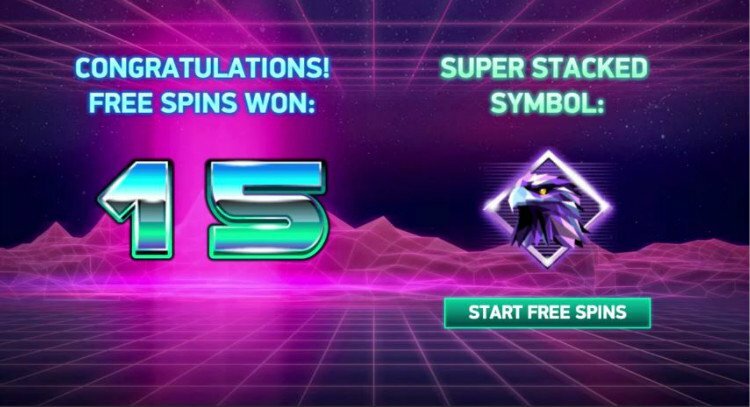 Although free spins cannot be re-triggered, during this bonus round, a game symbol will be randomly selected and will be stacked for all free spins.